First of all I must clarify that my name contains a couple of misspellings (something went wrong during the registry for my birth record...). It should be read 'Yari Davidsohn' (a mix of Hebrew and German). Anyway, I'm now working at Caltech, in Peter Capak's team. My goal is to investigate high-z galaxy growth and mechanisms halting star formation in the first, massive galaxies (looking forward to the launch of JWST, to move to higher redshift/smaller masses). As a full member of the COSMOS team I am involved in many other complementary projects. Recently I took also part of the Euclid Consortium. The past decade has seen significant advances in the study of galaxy evolution prompted by large astronomical surveys. They have been devised to conduct a census of star-forming and quiescent galaxies at different redshifts, by sampling wide portions of the sky and going deeper and deeper to span very large intervals of cosmic time. What are the processes responsible for baryonic/stellar mass accretion in the early universe? Are there passive galxies at z>4, and how did they stop forming stars? What is the role played by active galactic nuclei? 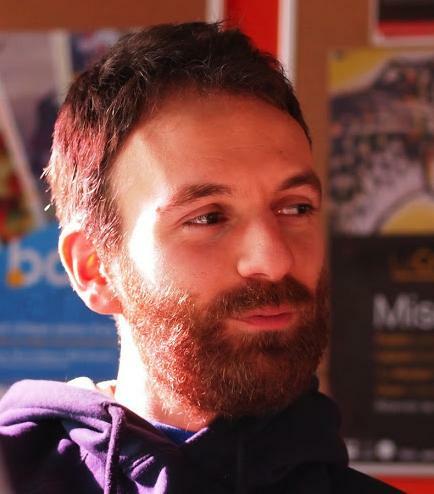 On the technical side, I spend efforts to optimise IR photometric source extraction and SED fitting techniques, especially to correctly identify high-z galaxies, and recover their physical properties. I am also intrigued by new observational analyses like self-organizing maps and cosmic filament reconstruction. We trace the specific star formation rate (sSFR) of massive star-forming galaxies from z~2 to 7. Our method is substantially different from previous analyses, as it does not rely on direct estimates of star formation rate, but on the differential evolution of the galaxy stellar mass function (SMF). We show the reliability of this approach by means of semi-analytical and hydrodynamical cosmological simulations. We then apply it to real data, using the SMFs derived in the COSMOS and CANDELS fields (respectively, red circles and squares in the figure below). We find that the sSFR is proportional to (1+z)1.1±0.2 at z>2, in tension with the steeper evolution predicted by simulations between z=2 and 4. We investigate the impact of several sources of observational bias, which however cannot account for this discrepancy. At z>5 our results are affected by large uncertainties, but we show that future large-area surveys will substantially reduce them, making our method an effective tool to probe the massive end of the main sequence of star-forming galaxies..
We obtain a view over 13 billion years of stellar mass assmebly in 10 snapshots , by deriving the stellar mass function and cosmic stellar mass density of galaxies in the COSMOS field up to z~6 (see figure below). We rely on the photometry included in the COSMOS2015 catalogue, but we provide a new estimate of photometric redhisfts at z>2.5 with an improved version of the code LePhare. Our work provides a comprehensive view of galaxy stellar mass assembly between $z=0.1$ and 6, for the first time using consistent estimates across the entire redshift range. 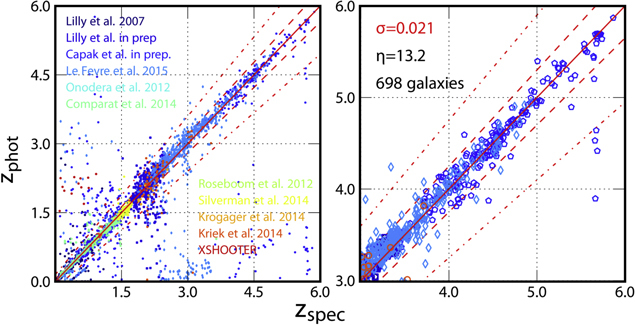 We select a mass-complete sample (>1010.2 ℳ⊙) of quiescent galaxy candidates at 3<z<4. We investigate the link between stellar and dark matter by matching the GSMF with the mass function of their hosting haloes. Assuming a Schechter funtion profile, we find that the major limitation in this kind of studies is that the slope of the fit depends on the characterisation of the observational uncertainties, which is crucial to properly remove the Eddington bias. There is currently no consensus on the method to quantify such errors: even using state-of-the-art datasets, different recipes for error deconvolution result in different best-fit Schechter parameters. 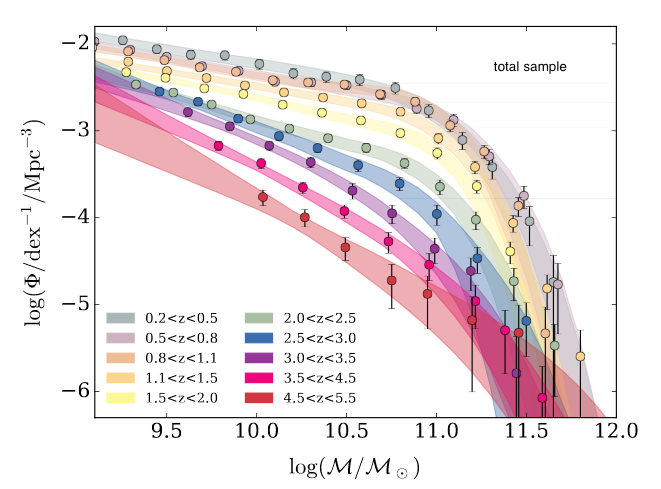 We investigate environmental effects in the evolution of galaxies between z = 0.5 and 0.9, relying on the galaxy local density field measured in Cucciati, Davidzon, et al. (2017). Several studies have already derived the GSMF as a function of different galaxy environments (e.g., clusters vs field) but this is the first one in which their number denisty is correctly normalised (from a 3-D Voronoi decomposition of the probed volume). This allows us to compare not only the GSMF shape, but also their growth as a function of redshift (see plot). We find that the evolution of low-density regions is described well by the formalism introduced by Peng et al. (2010, ApJ, 721, 193), and is consistent with the idea that galaxies become progressively passive because of internal physical processes. This mass quenching is not sufficient to describe the evolution of the mass function in the high-density regions: a significant contribution from dry mergers is required. Cucciati, Davidzon, et al. 2017 (A&A, 602, A15). We use the final data of the VIMOS Public Extragalactic Redshift Survey (VIPERS) to investigate the effect of environment on the evolution of galaxies between z = 0.5 and 0.9. We use about 75,000 accurate spectroscopic redshift over an area of 23.5 sq deg. We also consider the photometric redshifts (and their probability distribution function) of the total sample of photometric galaxies with i<22.5 mag. We characterise local environment in terms of the density contrast (δ) smoothed over a cylindrical kernel, the scale of which is defined by the distance to the 5th nearest neighbour (see plot). We investigate the dependence of active and passive galaxy fractions as a function of δ. Comparing to the semi-analytical model of De Lucia & Blaizot we emphasize the discrepancies in the overdensities, a general result pointing out the improvments still needed in simulations to correctly describe environmental quenching mechanisms. Davidzon et al. 2013 (A&A, 558, A23). We measure the evolution of the GSMF from z = 1.3 to z = 0.5 using the first public data release of VIPERS. Thanks to the large volume and depth of the survey, Poisson noise and cosmic variance of our GSMF estimates are comparable to the statistical uncertainties of large surveys in the local universe. We determine with unprecedented accuracy the high-mass tail of the galaxy stellar mass function, which includes a significant number of galaxies that are too rare to detect with any of the past spectroscopic surveys. 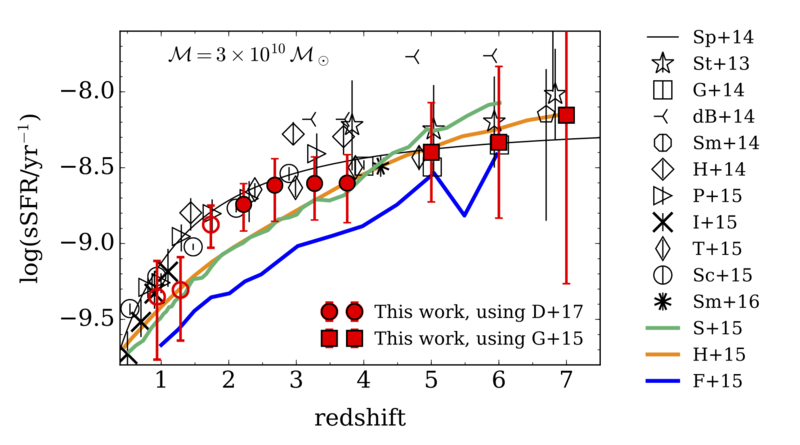 We are able to separately trace the evolution of the number density of blue and red galaxies with masses above 1011.4 ℳ⊙, in a mass range barely studied in previous work (see the plot below). We detect a population of similarly massive blue galaxies, which are no longer detectable below z = 0.7. 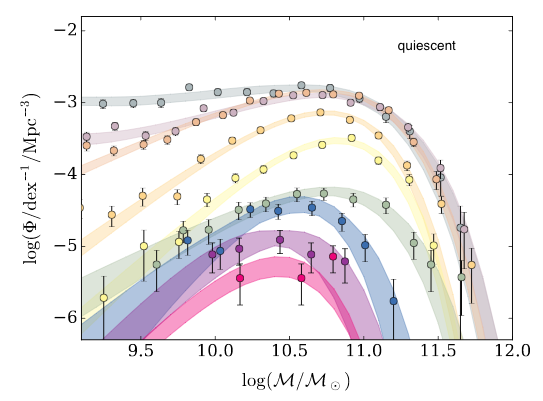 These results give initial promising indications of mass-dependent quenching of galaxies at z ≃ 1.